Sick of hearing about the iPhone X and iPhone 8? Here's something to distract you: a leak purporting to detail the new Google Daydream View virtual reality headset has surfaced today. As part of the large Google device dump, courtesy of Droid Life, we see a noticeably updated VR viewer. This headset has a more refined, finished look than the current Daydream View. The gap between the front flap and main headset is significantly reduced, and the top has a smoother slope. The material of the Daydream View 2 appears to be a bit more durable and has a brushed-finish look, versus the first edition's stretched-out fabric feel. The controller looks about the same, though the lip under the top portion looks slimmer. 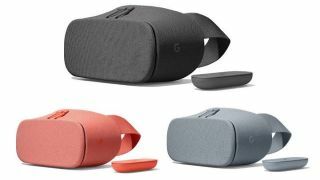 The Google Daydream View 2 also purportedly comes in new colors. Charcoal, Fog and Coral take the stage over the original's Snow, Crimson and Slate (better known as 'dark gray sweatpants' in the TechRadar offices). We're partial to coral, but an interesting note is that in addition to the new hues, the updated headset will reportedly sport a higher price tag. DroidLife, which doesn't say where it got the image or information, reports the new Daydream View will cost $99 (about £75 / AU$125). This is $20 more than the original headset, which costs $79 / £69 / AU$119. The new price would put the Daydream View in line with the Samsung Gear VR, though it remains significantly less than the (more powerful) HTC Vive and Oculus Rift. What could you be paying $20 more for? In addition to potentially better build materials, the new headset could feature some serious spec boosts. We'll likely hear all about the new Google Daydream View at the company's October 4 event, where we also expect to see the Pixel 2 and also just-leaked Google Home Mini.